She is also one of the founders of the Give It Back Foundation, an organization that raises money for local charities; and currently works as a mindset coach with both her alma mater, the University of Washington, and Compete to Create, a culture accelerant company founded by Coach Pete Carroll and Dr. Michael Gervais. What Get’s Courtney Thompson Fired Up? Gold Medal Squared is thrilled to nurture a partnership with such an accomplished and inspiring person, and has every faith that Thompson will bring an undaunting enthusiasm to GMS, as she does in every other area of her life. 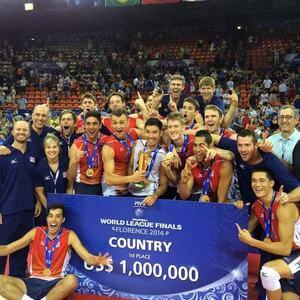 Founded in 1985, Gold Medal Squared is the worldwide leader in volleyball education and innovation. Over 1000 programs at every level have won championships using the principles learned at Gold Medal Squared events.